There’s a saying in the office here at IMPLAN that goes something like “our clients are often way more creative than we are at finding ways to use the software.” That’s never been more true of the Rand corporation in their collaboration with the Louisiana State University in their joint 2-year research project “Economic Evaluation of Coastal Land Loss in Louisiana” which was commissioned by Louisiana’s Coastal Protection and Restoration Authority in December of 2015. I sat down with Maria Lucas, consulting economist and customer success manager, to unpack the methodology. Tim French: At first glance this looks like a really complex study. The study pulled information in from a lot of data sources aside from IMPLAN’s. There was a lot going on. What was the most interesting part of the study to you—as an economist? Maria Lucas: What was really interesting about it was all the layers of scenarios they did. They had the land loss modeled out along the lines of “bad” versus “very bad.” They had the three storm scenarios as well as a time horizon variable. . From there, they were able to estimate the land loss of every combination of the levels with each of these variables, land loss severity, storm trajectory and time. It was really cool because it showed that if we get our ducks in a row in a certain region, then the potential fallout from the storm could be a lot less bad than if we did nothing. Obviously we can’t stop a storm from coming, so it was interesting to throw in that dynamic of what we don’t have control over. TF: Right—they were pulling from the original 2012 Coastal Master Plan for the state which was an interesting starting point because it described which areas of the coastline should receive conservation support based on the potential for land loss. And then this study was commissioned to take a look at the economic side of those conservation efforts. To accomplish that research task, they started with the weather pattern scenarios which were described in the Master Plan to then link it all up. How did they end up translating seemingly non-financial storm effects as detailed as the projected hundreds of millibars of air pressure from landfall into economic effects? ML: What they did was look at land loss from sea level rising and then land loss from storms. And they mapped that to then figure out what land would be “at risk,” figure out what businesses are currently on those lands, and then model the loss in economic contribution to various regions from losing those business activities. So really, they made a simple move from “here’s the land that will go away from these various scenarios” to “here’s the loss of business activities on that land. TF: That brings us to one of the core assumptions made in modeling the economic effects for the 25-year storm track or the 50-year storm scenario: That the business activity on those lands would be unchanged in future years; that the structure economy would not fundamentally change. Is common to make that assumption? ML: With IMPLAN that’s an inherent limitation. You could, of course, go in and make some changes to how an economy is structured if you wanted to model a specific change that might happen further down the line. But I think people do typically bear that limitation in mind rather than alter the underlying data. Generally, we advise that you don’t go out further than five years if you’re going to model something and if you want to venture out further than that then you’re kind of on your own. We do make that caveat. This becomes an issue when trying to model technology change where a new technology might contribute a lot to an economy but it’s difficult to discern specifically how that would alter an economy in terms of household spending or in various supply chains. Many studies using IMPLAN are shorter-term anyway. TF: I suppose that’s the case whether the study is economic in nature or not—none of us are time travelers (that I know of). ML: That’s right. Now, there are ways in which, if you were to assume what the future would look like, that you could make the model reflect that. But still, you never know what’s going to happen in reality. TF: Implicit in the land loss models is this idea that if one land area is at a higher risk of falling into the gulf compared to another land area, then you should spend your conservation dollars on the higher-risk area. Why, then, bother to take an economic look at these scenarios? What is it about this study that qualifies those choices? ML: First, there are aspects of the coastal economy which are unique to more inland economies based simply on the fact that those lands are near the water (think fishing, tourism). Every time that coastline moves, those businesses are at risk and they’d have to either move or never reopen again. So it’s another layer on top of the conservation to show this is also what’s at stake if we do nothing about this land loss and what this region could lose in terms of economic benefit. Those businesses may not have the ability to proactively relocate either because they don’t have the funds or because they need to operate at that specific point where land meets water and they can’t keep moving back inland ten yards every two years. But also, they looked at economic impacts to economic regions further inland as well as the rest of the country. From that perspective, you’re looking at whether businesses which close along the coast end up having employment, tax, or other economic impacts further inland. In the study they go into really detailed information in terms of the industries—specifically with oil, they do oil drilling off the coast and if they lose that land or those access points then they can’t continue drilling and people would have to start importing foreign oil or sourcing their oil from elsewhere. TF: That really fascinates me because even though this was a state-commissioned study, they did take the time to expand their look at the impacts on the rest of the country. ML: Of course, people will make their arguments about those results. IMPLAN is annualized so those are impacts which will happen inside the year that those land loss effects are felt. And, if we take just the example of oil, does that mean that people in the United States have to get their oil from somewhere else and does that mean that the “somewhere else” will benefit significantly because of that shift in the economy? Their analysis assumes that there is only that loss to the rest of the economy, it doesn’t necessarily show what could be the behavioral shift in the economy and what other impacts might result. It does definitely measure the initial shock to the economy for Louisiana and the rest of the country. But as far as how the economy bounces back, that’s a whole other question. 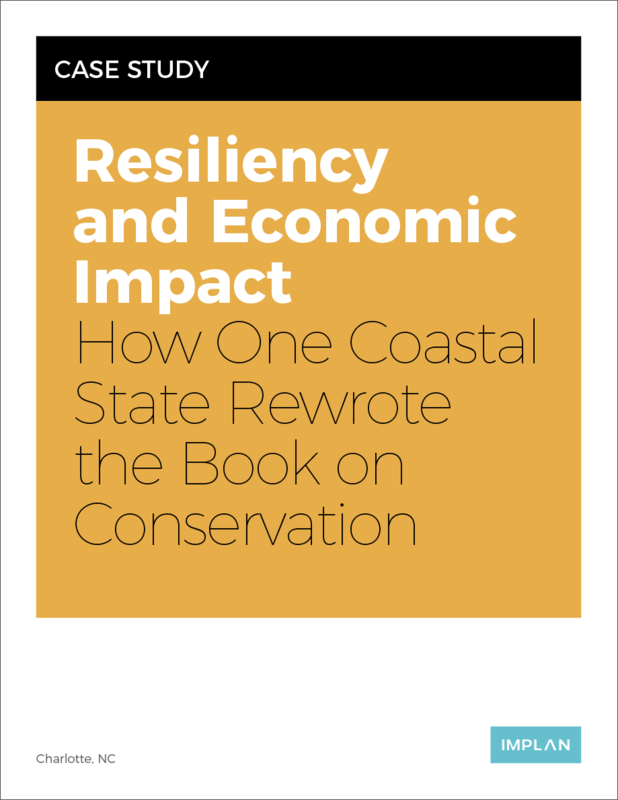 It does give you a solid perspective on how supply chains or households throughout the national economy would be affected by land loss along the coastline of Louisiana—something that an ecological study on its own can’t tell you.